The best part about an imminent iPad 3 release? 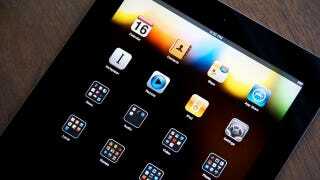 You can pick up an iPad 2 on the cheap. Best Buy's cutting $50 from the cost of Apple's soon-to-be-previous model tablet, meaning the price of admission for a 16GB Wi-Fi model is now just $450. The caveat, of course, is that the next generation iPad is due as early as March 7th, and given Apple's pricing strategy in the past, the base model will likely cost the same $500 as it has the previous two generations. So while you're saving 50 bucks, you'll be giving up on some enticing rumored features like a faster processor, a near-retina display, and 4G connectivity for data plan models.